This sublease was designed for a sublease of a portion of the corporate tenant's premises for the remainder of the term of the lease. It also provides for payments to the tenant from the subtenant with respect to the purchase of certain fixtures by the subtenant for use in the subleased premises during the sublease. THIS SUBLEASE ("Sublease"), dated as of the ___th day of ________, by and between __________ , having an address at ______________ ("Tenant"), and ______________, having an address at _________________("Subtenant"). B Tenant desires to sublease to Subtenant, and Subtenant desires to hire from Tenant, the Premises upon all of the terms and conditions hereinafter set forth. Upon the terms and conditions hereinafter set forth, Tenant hereby subleases to Subtenant and Subtenant hereby hires from Tenant the Premises. The definitions and basic provisions set forth in the Lease are incorporated herein by reference for all purposes and shall be used in conjunction with and limited by the references thereto and the terms and definitions in the provisions of this Sublease. 2.01 Generally. The term of this Sublease (the "Sublease Term") shall commence on the Commencement Date (as defined in Section 2.02 below) and shall end at 11:59 p.m. on ___________ (the ''Expiration Date'') or on such earlier date upon which this Sublease shall be terminated pursuant to any of the provisions of this Sublease or pursuant to law. 2.02 Commencement Date. The "Commencement Date" shall be the first date, on or after ___________, upon which Landlord shall have given its written consent to this Sublease as required under Section 9 of the Lease. Tenant shall apply for Landlord's consent, but Tenant shall not be required to make any payment to Landlord (or to take any other acts or sign any agreement) in order to obtain such consent. Subtenant shall promptly furnish to Tenant such references, financial statements and other information with respect to Subtenant as Landlord shall request. 2.03 Bilateral Cancellation Option. If the Landlord's written consent to this Sublease shall not have been given by the date thirty (30) days after the date of this Sublease, then, at any time thereafter but prior to the date upon which the Commencement Date occurs, either Tenant, at its option, or Subtenant, at its option, may cancel this Sublease by giving written notice thereof to the other party, whereupon this Sublease shall be canceled and neither party hereto shall have any rights against or obligations to the other under this Sublease or otherwise. 2.04 Confirmation of the Commencement Date. Promptly following the Commencement Date, Tenant and Subtenant shall execute an agreement substantially in the form of Exhibit B annexed hereto, setting forth the Commencement Date. Failure of the parties to execute such an agreement shall not defer the Commencement Date or otherwise invalidate this Sublease. Subtenant accepts the Premises in their "as is" condition on the Commencement Date and Tenant shall not have any responsibility for the quality, condition or fitness for use of the Premises and shall not be required to do any work to construct the Premises or to prepare the Premises for Subtenant's use or occupancy. 4.01 Rates of Fixed Rent. For the purposes of this Sublease, the term "Rent Commencement Date" shall mean _______, 19__. During the period commencing on the Rent Commencement Date to and including the Expiration Date, Subtenant shall pay Tenant annual rent at the net rate of _____________ and 00/100 DOLLARS ($_______) per annum ("Fixed Rent"), calculated as set forth on Exhibit ___ attached hereto, which amount includes certain sums constituting the Monthly Fixtures Payment Installments referred to in Section 24.01 below. 4.02 Terms of Payment of Fixed Rent. Fixed Rent shall be payable in equal monthly installments of a net amount of $_______, in advance, on the Rent Commencement Date and thereafter on the first day of each calendar month during the Sublease Term, without notice or demand therefor and without any deduction, credit, set-off, counterclaim or abatement whatsoever, except as otherwise expressly provided for in this Sublease. If the Expiration Date occurs on a day other than the last day of a calendar month, the Fixed Rent for the month in question shall be prorated on a per diem basis. 4.03 Penalties. In the event any installments of the Fixed Rent are not received within ten (10) days after the due date thereof (without in any way implying Tenant's consent to such late payment), Subtenant, to the extent permitted by law, agrees to pay, in addition to such installments of the Fixed Rent or such other sums owed and to pay an additional five percent (5 %) of such aggregate installment amounts for each successive thirty (30) day period thereafter that such delinquent installments remain unpaid, it being understood that such late payment charges shall constitute liquidated damages and shall be for the purpose of reimbursing Tenant for the additional costs and expenses which Tenant presently expects to incur in connection with the handling and processing of late installment payments of the Fixed Rent and such other sums which become owing by Subtenant to Tenant hereunder, provided, however, that Subtenant shall not be obligated to pay such late charge during any twelve-month period calculated from the Commencement Date of this Sublease until Tenant has delivered one (1) written notice to Subtenant specifying that Subtenant has failed to pay an installment of Fixed Rent within ten (10) days after the due date and as to any and all installments of Fixed Rent due thereafter, including without limitation the delinquent installment specified in the Tenant's notice if not paid within thirty (30) days of the date due, Subtenant shall be liable to pay the late charges specified in this paragraph arising during the remainder of such twelve-month period. Tenant and Subtenant expressly covenant and agree that in the event of any such late payment(s) by Subtenant, the damages so resulting to Tenant will be difficult to ascertain precisely, and that the foregoing charge constitutes a reasonable and good faith estimate by the parties of the extent of such damages. Notwithstanding the foregoing, the above-described late charges shall not apply to any sums constituting Monthly Fixtures Payment Installments from and after the date of any acceleration of the Monthly Fixtures Payment Installments pursuant to Article 24 below, or any sums which may have been advanced by Tenant to or for the benefit of Subtenant pursuant to the provisions of this Sublease, including without limitation Subtenant's Proportionate Share of Basic Costs, it being understood that such sums shall bear interest, which Subtenant hereby agrees to pay to Tenant, at the lesser of the maximum rate permitted by applicable law or the prime rate of interest announced from time to time by ______________ Bank or its successor or assign plus three percent (3%) from the date due hereunder. 5.01 Additional Rent. Commencing on the Commencement Date and thereafter throughout the Sublease Term, Subtenant shall pay as additional rent the amounts determined as hereinafter set forth in Sections 5.03, 5.04 and 5.05 hereof. Commencing on the Rent Commencement Date and thereafter throughout the Sublease Term, Subtenant shall pay as additional rent the amounts determined as hereinafter set forth in Section 5.02 hereof. If Subtenant fails to pay any additional rent hereunder, then Tenant shall have all of the rights and remedies available to it for a failure to pay Fixed Rent. (i) "Subtenant's Proportionate Share" shall mean the percentage which expresses the ratio between the number of Rentable Square Feet (as defined in the Lease) comprising the Premises (______), and the number of Rentable Feet of the Building (_________), which for the purposes of this Sublease shall be ____%. (ii) "Expense Stop" shall mean the amount the actual Basic Cost per Rentable Square Foot for the Building for the calendar year. (iii) "Basic Cost" shall have the meaning ascribed thereto in, and shall be computed in accordance with the provisions of; Exhibit ___ attached to the Lease. (iv) "Taxes" shall have the meaning ascribed thereto in, and shall be computed in accordance with the provisions of; Section 17 of the Lease; provided, however, the references in such Section 17 to "Landlord" shall be deemed to refer only to Landlord. (v) "Basic Cost Payment" for any year shall mean an amount per annum equal to the Subtenant's Proportionate Share of the excess of (A) the Basic Cost for such year, over (B) the Expense Stop. (b) Subtenant shall pay Tenant the Basic Cost Payment for each year, as additional rent hereunder. If the Expiration Date occurs on a day other than the last day of any year, the Basic Cost Payment for the year in question shall be prorated on a per diem basis. No Basic Cost Payment will be due under this Sublease for any portion of calendar year 19__. (ii) estimate the Basic Cost Payment for the entire calendar year and reduce the same to an amount bearing the same proportion to the full amount of the estimated Basic Cost Payment for such year as the number of days in such fractional year bears to the number of days in the full calendar year. (d) Within twenty (20) days after Tenant receives the Landlord's statement of Basic Cost (the "Landlord's Statement") for any year, Tenant shall provide Subtenant with a statement (the "Year-End Statement"), setting forth the Basic Cost Payment due for such year. Each Year-End Statement shall be accompanied by the corresponding Landlord's Statement furnished by Landlord to Tenant. Within ten (10) days after Subtenant's receipt of any Year-End Statement, Subtenant shall pay Tenant any deficiency or receive a credit (or, if this Sublease has expired, a payment) from Tenant for any excess, in either case, between the amount due pursuant to the Year-End Statement and the amount paid, if any, pursuant to the Estimate Statement. (i) Within ten (10) business days after its receipt of a First Dispute Notice, Tenant shall notify Subtenant in writing (the "Response Notice"), whether Tenant intends to dispute the Landlord's Statement in question. (ii) If the Response Notice indicates that Tenant does intend to dispute such Landlord's Statement, then Tenant shall use its reasonable good faith efforts to dispute such Landlord's Statement in accordance with the terms of the Lease. If as a result of such dispute Tenant actually receives a refund for the year to which such Landlord's Statement pertains, then Tenant, within fifteen (15) days after its receipt of such refund, shall pay to Subtenant an amount equal to the lesser of the following amounts: (x) the percentage, which expresses the ratio between the Rentable Square Feet of the Premises leased under (and as defined in) the Lease (______) and the Rentable Square Feet of the Premises subleased hereunder (_____) (such percentage being equal to _________), of the amount of the refund, net of the costs (including attorneys' and expert witness fees) incurred by Tenant in connection with such dispute, or (y) the, amount actually overpaid by Subtenant for such year in compliance with the Landlord's Statement that is the subject of the dispute. Any determination which Tenant shall accept or by which Tenant shall be bound in connection with any such dispute shall be binding upon Subtenant. (iii) If Tenant fails to serve timely the Response Notice, or if the Response Notice indicates that Tenant does not intend to dispute such Landlord's Statement, the Subtenant, at its sole cost and expense and in Tenant's name, may dispute such Landlord's Statement in accordance with the terms of the Lease; provided, however, that Subtenant shall prosecute such dispute strictly in accordance with the terms of the Lease and shall use reasonable good faith efforts in connection with such dispute, and Subtenant shall, and Subtenant hereby does, indemnify and hold harmless \ Tenant from and against all claims, actions, liabilities, losses, damages, costs and expenses (including reasonable counsel fees) arising out of or in connection with such dispute. If as a result of such dispute Subtenant actually receives a refund for the year to which such Landlord's Statement pertains, then Subtenant, within fifteen (15) days after its receipt of such refund, shall disburse such refund as follows: first, such refund shall be retained by Subtenant in an amount equal to the sum of (y) the costs (including attorneys' and expert witness fees) incurred by Subtenant in connection with such dispute, plus (z) the amount actually overpaid by Subtenant for such year in compliance with the Landlord's Statement that is the subject of the dispute; and second, the balance of such refund shall be paid to Tenant. (iv) Pending the resolution of any such dispute, whether by Tenant or by Subtenant, Subtenant shall pay to Tenant the amounts set forth in the disputed Year-End Statement. (f) If Tenant, pursuant to the provisions of paragraph (d) of Exhibit ___ to the Lease, actually receives a refund for any year, then Tenant, within fifteen (15) days after its receipt of such refund, shall pay to Subtenant an amount equal to the lesser of the following amounts: (x) ____% of the amount of the refund, net of any costs (including attorneys' and expert witness' fees) incurred by Tenant in connection with such refund, or (y) the amount actually overpaid by Subtenant for such year in compliance with the Estimate Statement. 5.03 Electricity. Landlord, subject and pursuant to the provisions of Section 4 of the Lease, furnishes electrical energy to the Sublease Premises. Landlord currently passes the cost of such electrical energy through to Tenant as part of the Basic Cost. However, pursuant to the Lease, Landlord has the right to separately meter any utility service (including but not limited to electrical service). In the event that Landlord determines to exercise such right with respect to the Premises, then Subtenant shall, during the term of this Sublease, pay all amounts due in respect of any such separately metered utility service (including but not limited to electrical service) in accordance with the provisions of the Lease. Subtenant hereby acknowledges that, notwithstanding anything to the contrary contained herein or in the Lease, the Fixed Rent payable hereunder (as opposed to the Basic Cost payable hereunder) does not include any amount or charge for the electrical energy or any other utility service furnished to the Premises. 5.04 Other Utilities. 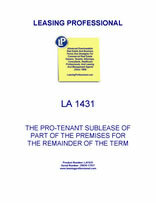 Subtenant, immediately upon its receipt of a demand therefor (whether from Landlord or from Tenant), shall pay to Tenant (or, at Tenant's direction, directly to Landlord) (a) all amounts payable to Landlord under the Lease in respect of the Premises during the Sublease Term, and (b) all amounts payable to Landlord under the Lease or otherwise for any service or utility provided to the Premises at Subtenant's request and/or attributable to Subtenant's operation or use of the Premises, including, without limitation, freight elevator service or overtime HVAC. Nothing contained in this Section 5.04 shall be construed to impose upon Tenant any obligation, liability or responsibility whatsoever to Subtenant to provide or perform any utilities or services in or relating to the Premises, the Building or Subtenant's operation or use of the Premises or the Building, and Subtenant acknowledges and agrees that Tenant shall have no such obligation, liability or responsibility. 5.05 Miscellaneous Fees. Subtenant, immediately upon its receipt of a demand therefor (whether from Landlord or from Tenant), shall pay to Tenant (or, at Tenant's direction, directly to Landlord) all fees and charges payable under the Lease which are attributable or to Subtenant's operation and use of the Premises or to Subtenant's use of the facilities and services of the Building, or which are payable by reason of any act or omission of Subtenant, including, without limitation, (a) any increases in Tenant's or Landlord's insurance premiums, (b) any fee imposed by Landlord, and any expenses incurred by Tenant, for the review of plans and specifications or inspections done pursuant to this Sublease or the Lease with respect to the Premises, and (c) any fee imposed by Landlord (including reasonable attorneys' fees and disbursements) and any expenses incurred by Tenant (including reasonable attorneys' fees and disbursements), in connection with any proposed future assignment or subletting of the Premises, as requested by Subtenant. Additionally, Subtenant shall, during the term of this Sublease, pay any other amounts required to be paid in respect of the Premises in accordance with the terms of the Lease.